Foraging interest and activity always peaks in the fall. Then inevitably it declines quickly with the cooler weather. 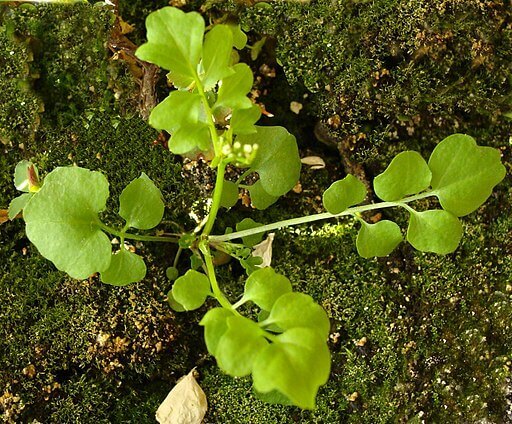 There is a lot of interesting plants to forage that are available in the winter and for some such as hairy bittercress they even continue to grow on days that are warm enough. Getting familiar with these plants will hopefully get us outside and engaged with nature even in the winter. I tend to be a little lazy when it comes to food preparation. That’s one reason I like to forage for barberry in the winter. 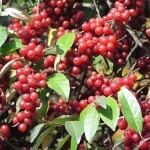 It is one of the few berries like greenbrier that are available in the winter to just pick and eat with no preparation. I must admit the taste is complicated, it is mostly bitter, but with a little sweetness and a little acidity. 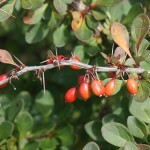 The non-native barberry shrub is very prolific in the northeastern US and is considered invasive in much of it’s area. You should have no guilt harvesting as many berries as you want. You will likely first notice the bright red berries hanging on the shrub through most of the winter. Cutting through a branch and looking at the bright yellow wood inside is also a good identification feature along with the small and very sharp thorns lining all branches and stems. 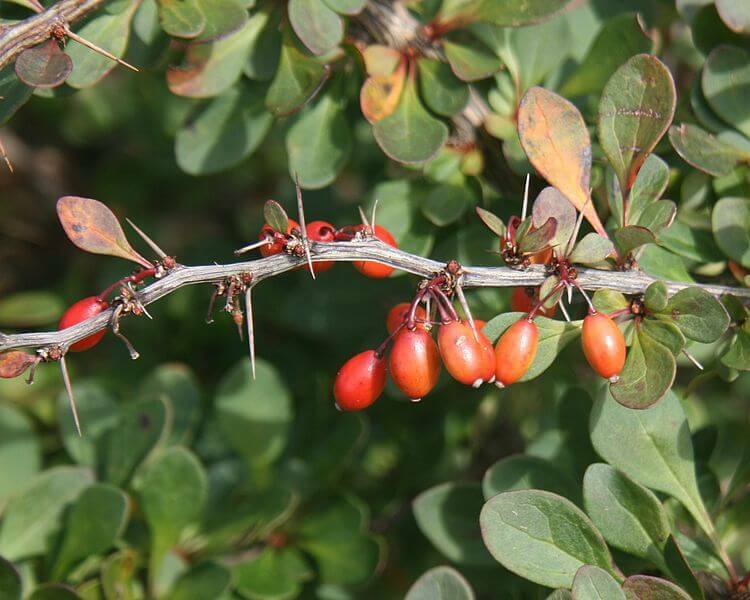 See our article Japanese Barberry, Invasive Winter Fruit for more information. This is one of a number of edible evergreen trees, others include eastern hemlock, fir and pine. Not all evergreen trees are edible. Yew shrubs which can sometimes take the form of small trees can be deadly toxic. The good news is that spruce are easy to distinguish from yews. It’s just good to at least be aware that they are out there sometimes growing side by side. The most common types of spruce in my area are Norway spruce, blue spruce and white spruce. These 3 are also very common across the country but it would be helpful to learn what species are common in your area. In the dead of winter spruce shoots can be used to make tea. The flavor takes a little getting used to but this quickly becomes a familiar warming tea in winter. When spring comes the spruce tree has other edible parts including young shoots and young cones. They have a strong flavor but usually not inedible and as with the tea the more you taste spruce the more familiar it becomes. 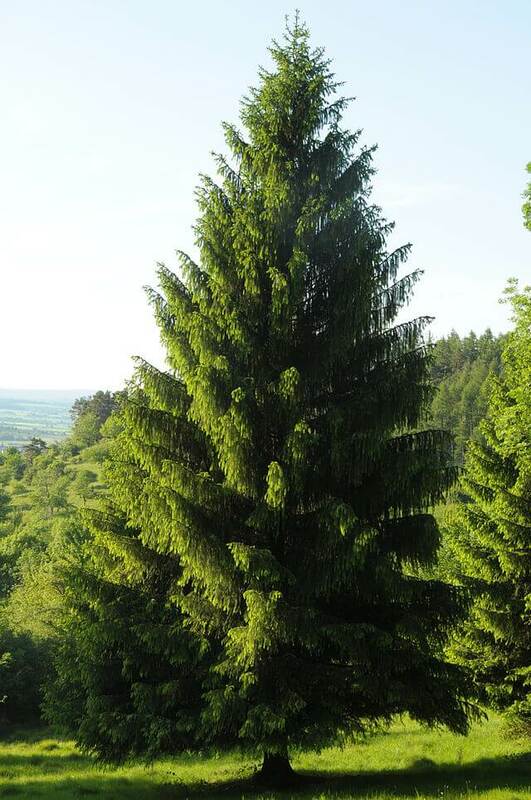 See our article Spruce – Surprisingly Edible Abundant Evergreen Tree for more information. Edible winter rose hips really only refer to multiflora rose as far as I know. They will sometimes hang on all the way into February depending on how quickly the cold weather sets in. All rose hips are edible but I haven’t seen others make it into the winter. 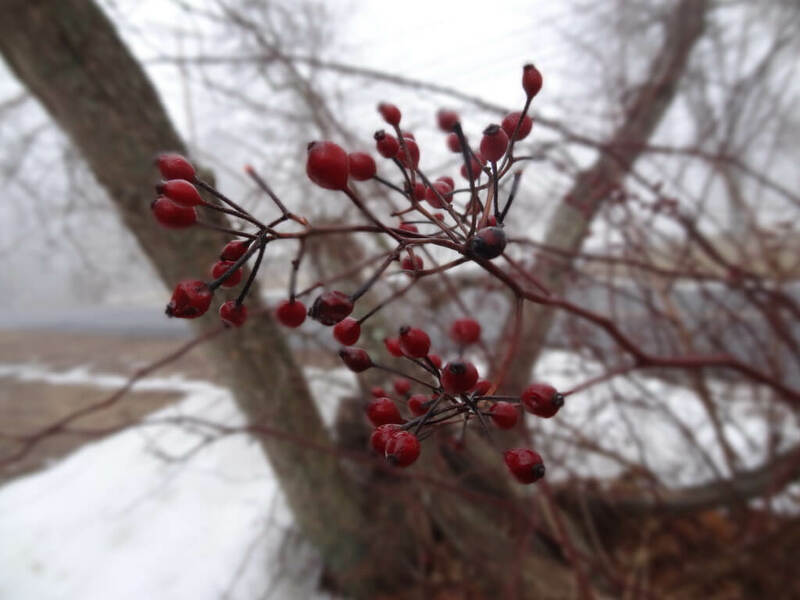 If the weather gets cold quickly in december and the multiflora rose hips do not have a chance to decay they will stay on the plant for months into the winter and become sweet with the cold weather. If you have a warm winter they will likely decay in December. Multiflora rose is easy to identify once your looking at the vines up close. 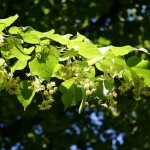 It is an invasive vine so harvest as much as you want. First you will notice the groups of rose hips projecting away from the vine. Then once you look at the vine you’ll see the large curved thorns that leave a distinctive oval scar when snapped off. Rose hips have small fibers protecting the seed. Multiflora rose hips are very small and can be eaten without a lot of concern for the small fibers. If you have the opportunity to easily harvest a lot of rose hips then making them into a tea works great. 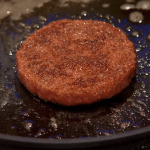 You’ll even be able to filter out the seeds and fibers through a cloth. In the early spring newly sprouted rose foliage can be eaten before it forms thorns. 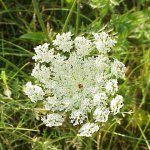 See our article Multiflora Rose, An Invasive but Nutritious Wild Edible for more information. Hairy Bittercress is a small winter annual lawn weed which is a member of the cabbage family. A Winter annual is a plant that has the opposite life cycle than many of the summer annual weeds that are common such as crab grass and wood sorrel. Winter annuals like hairy and pennsylvania bittercress are generally seeded in the summer, they grow all the way through the winter in a semi-dormant state then release seed and die the next summer. Pennsylvania bittercress has most of the same characteristics as hairy bittercress but grows in wetter environments. 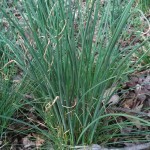 These plants have a characteristic shape when young. 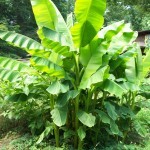 They consist of a basal rosette of pinnately compound leaves. Each leaflet resembles a small rounded heart shape. 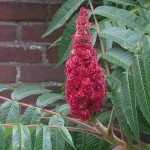 In the spring and summer they develop flower stalks from the center of the foliage. Bittercress has edible leaves and roots, although its probably easier to just cut the leaves from the roots. Each plant is very small in the winter but they are often very plentiful and easy to harvest. The flavor is mild resembling other members of the cabbage family. See our article Bittercress, a Nationwide Herb for more information. This is another edible evergreen tree. 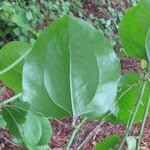 As mentioned before not all evergreen trees have edible foliage. The yew shrub is very toxic but it can easily be distinguish from spruce and the other edible evergreen trees. I write this paragraph with white pine in mind since it’s what I encounter the most and is extremely common in the northeastern US but the information applies to other pine trees as well. 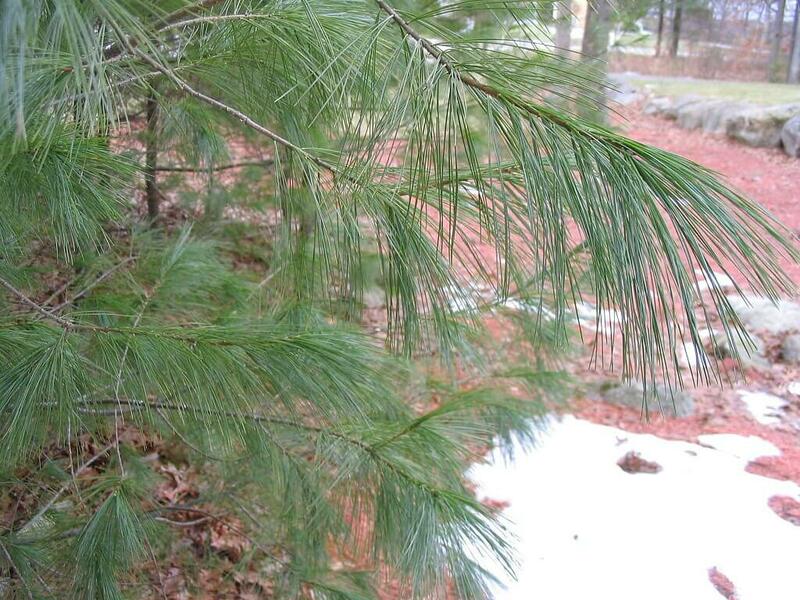 As with spruce, pine foliage also makes a great winter tea. The flavor is strong and does take some getting used to but it quickly becomes a comforting tea in my opinion. 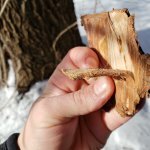 There are stories of native Americans eating young bark and inner bark throughout the winter. I have not found a way to prepare the bark to be palatable but its possible that it wasn’t very palatable to them either, or maybe they just got used to it. In the spring the shoots and young cones are edible. I have taken a liking to these but they too have a strong flavor. See our article on White Pine for more information. I already harvested the multiflora rose hips, before the birds got most of them! I have been adding them to smoothies. Oh! I never thought to add them to smoothies! Great idea! 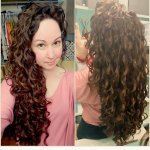 Thanks for sharing that! Love all of these. I don’t have bittercress here in northeast MA until spring, like probably April. All others are around. Laura I’ve noticed the edible rose hips are hit or miss for the winter. Getting them before the birds is always a good idea. lol. Iris I’m wondering if there might be some bittercress in the winter up there. I’m here in southern CT and years went by where i didn’t recognize it in the winter. but I’m not expert on bittercress so I’ll take your word for it.